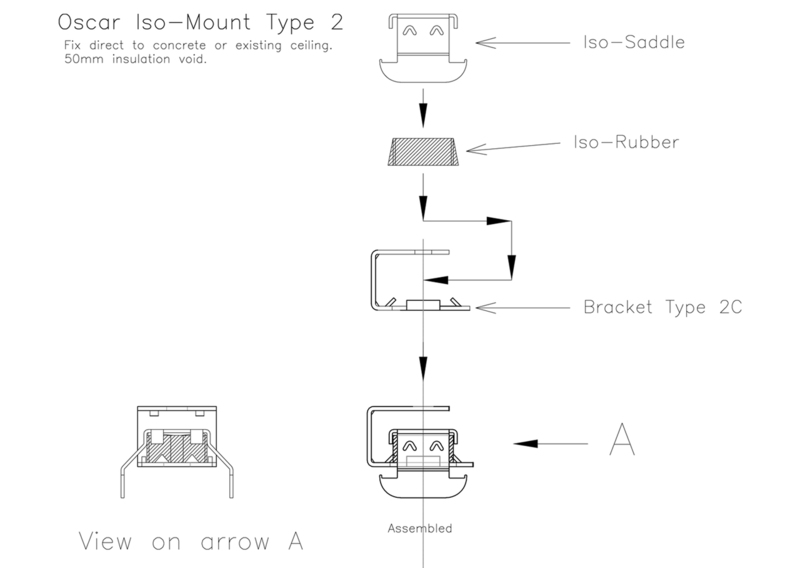 The Iso-Mount Type 2 significantly expands the versatility of our Oscar Iso-Mount range of isolating acoustic hangers for soundproofing ceilings. 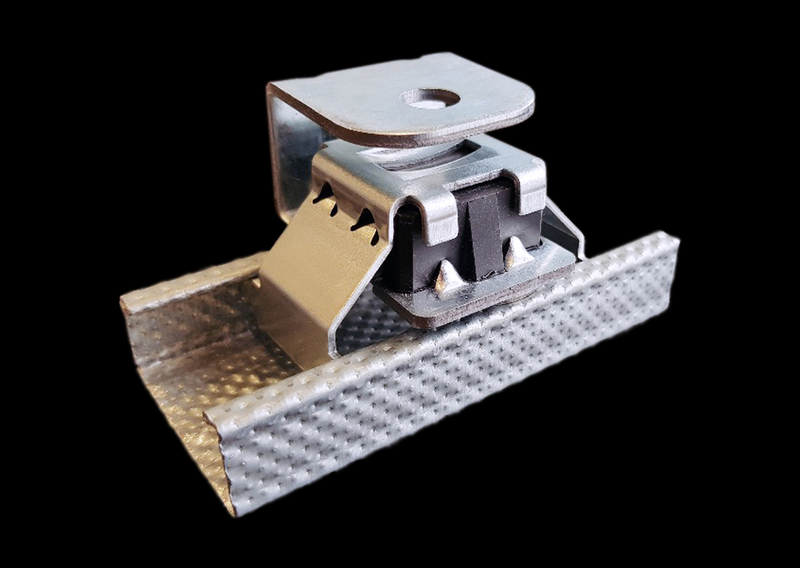 The Iso-Mount Type 2 can fix under existing ceilings without disruption, directly or with extensions for 50mm to over 1 metre voids for acoustic/thermal insulation and services. into plasterboard using 1 screw fixing into the timber joist per hanger. 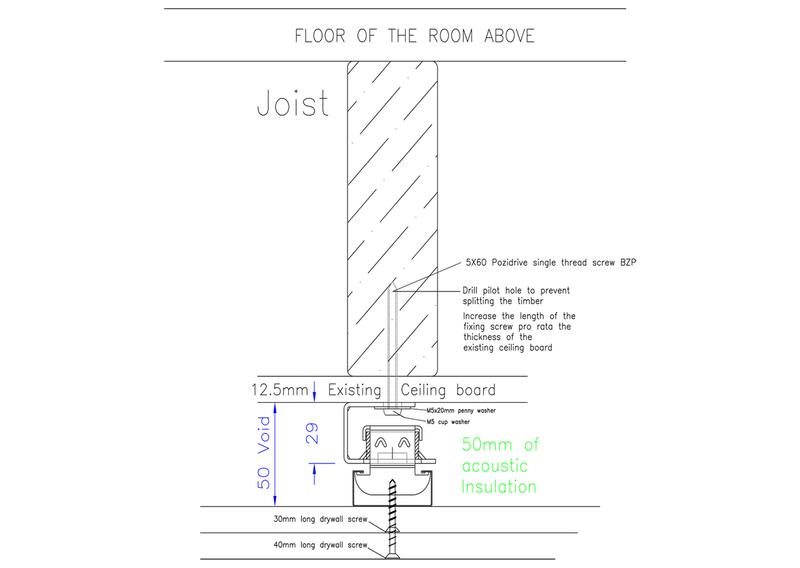 Improves the soundproofing of existing ceilings: impact and airbourne sound reduction. Fixes under existing concrete and timber joist ceilings with minimum fixings. All work is done from the room below. Your neighbours never need to know! Impact: The rubber block breaks the path of vibration reducing the sound of footsteps etc. 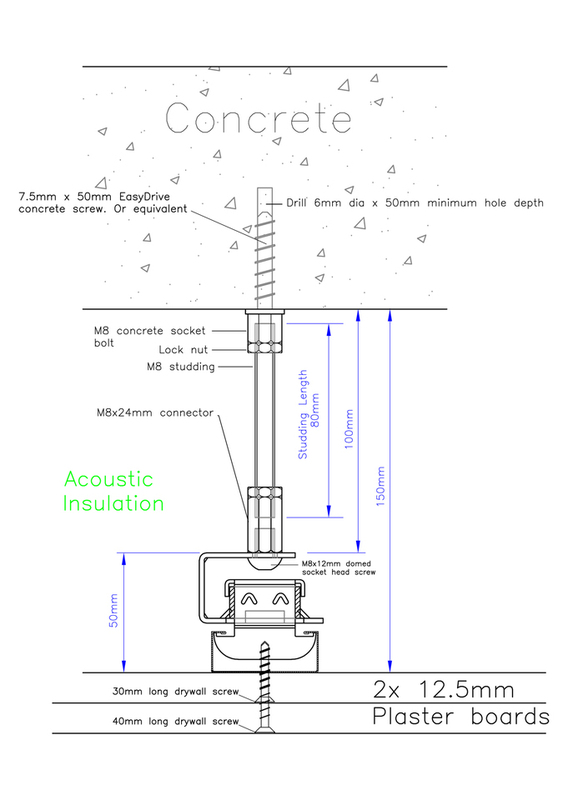 Airbourne: The additional acoustic insulation reduces the sound of voices, music, TV etc. All of the installation is completed working only from the room below. Just 1 hole to drill per mount; saves hours when drilling concrete. 18kg max load per Iso-Mount: 3 mounts/sq.mtr (spaced evenly) gives a maximum weight load of 54kg/sq.mtr. The GL1 ‘C’ Channel and GL3 Connectors are readily available from Travis Perkins, Builder Depot and Insulation shop, among others. Option 1 - Fixing directly through plasterboard into timber joists without removing the old ceiling. 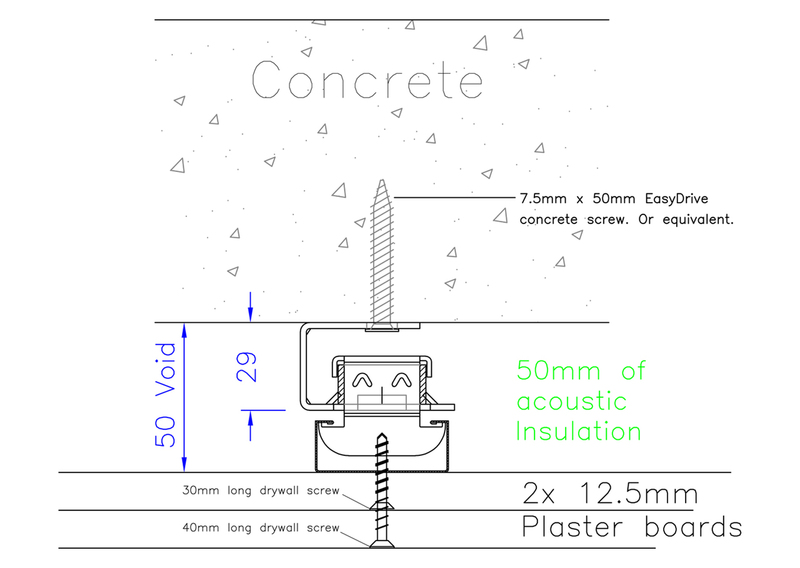 Creates a new isolated ceiling with a 50mm deep void for additional insulation. 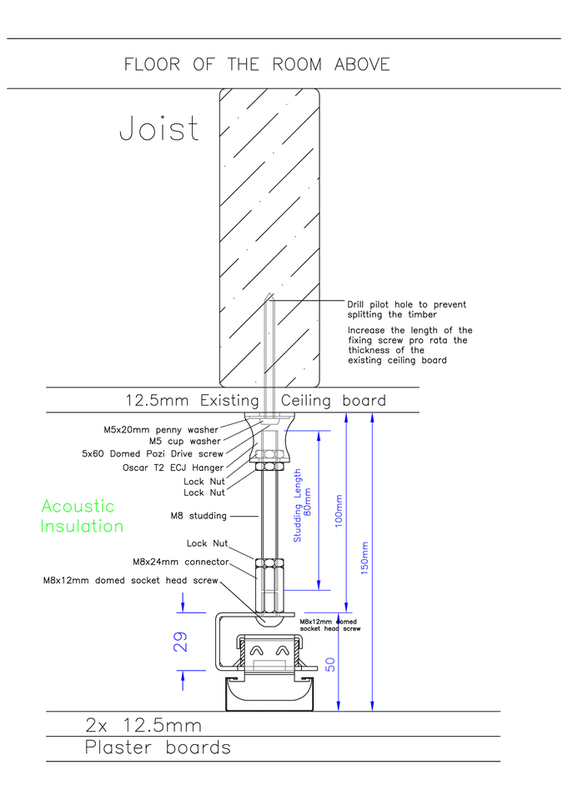 Option 2 - Fixing directly through existing plasterboard into timber joists without removing the old ceiling, using an extended acoustic hanger assembly. Option 3 - Fixing directly onto a concrete ceiling. Creates a new isolated ceiling with a 50mm deep void for additional insulation. Option 4 - Fixing directly on to concrete using the Concrete Hanger Extension fixed to the concrete. Creates a new isolated ceiling with a larger variable void for additional insulation and services. 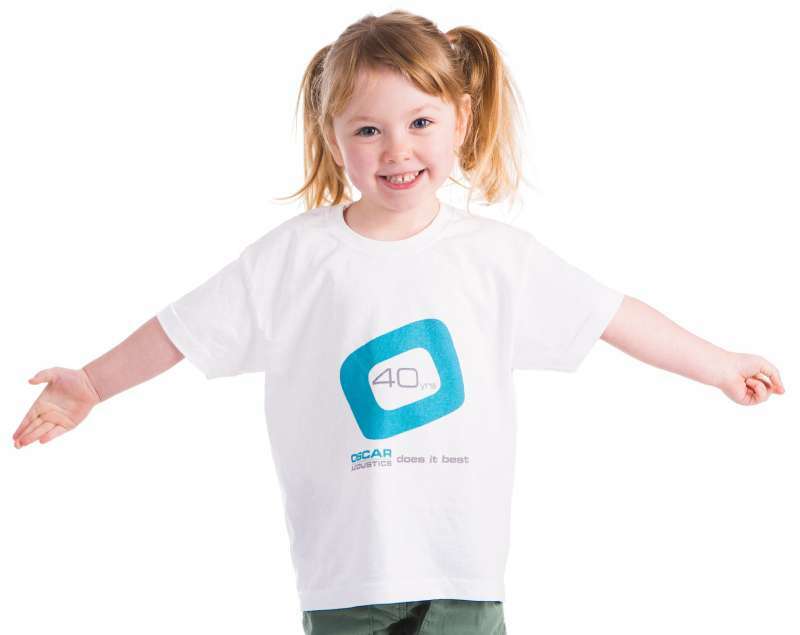 The Oscar Iso-Mount Type 2 will be available to buy online soon. In the meantime please contact us to order directly or enquire with one of our helpful team. Other components are purchased from your local stockist, further info is given on the installation pages. The systems can be installed by a competent DIY person, builders and in many areas we can recommend installers.